Given that tomorrow is New Year's Eve, it shouldn't be surprising that there are barely any comics being released this week. 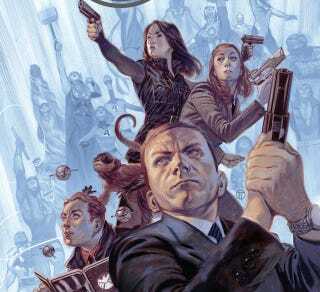 There are a few exceptions, however — none of which should excite you more than SHIELD #1, which finally brings the TV show's team to the Marvel comic-verse. • Abigail and the Snowman #1 (Boom) — When a young girl moves to a new town, she has a hard time making friends — that is, until she meets a yeti named Claude on the run from the government. Roger Landridge (W/A). • All New Miracleman Annual #1 (Marvel) — Joe Quesada himself illustrates Grant Morrison's long-lost Miracleman story, alongside several other new tales. Various (w/A). • SHIELD #1 (Marvel) — Fitz, Simmons, Skye and Melinda May make their comics debut, and their missions take them to every corner of the Marvel universe – and pair them with a wide assortment of heroes and villains we won't be seeing on Agents of SHIELD any time soon. • Star Trek/Planet of the Apes #1 (Boom) — "What could possibly cause Captain Kirk and the crew of the Enterprise to side with Dr. Zaius to protect Ape City? And what does Colonel George Taylor have to say about it? It's a madhouse! A madhouse!!" Scott and David Tipton (W), Rachael Stott (A).